In 1986, the United States Mint and the Treasury Department released the official silver bullion coin of the United States for the first time. The Silver American Eagle featured images of Liberty and the bald eagle, both symbols of American pride and democracy. Today, those images continue as the primary design features of the Silver American Eagle, which in its 30th year of production has become the world’s single most popular coin by volume. 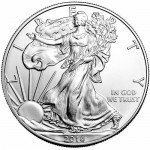 Now, Silver.com offers the 2016 Silver American Eagle in near-perfect condition. 30th anniversary striking of the Silver Eagle! Ships to you in a plastic slab for protection. Earned a grade of MS69 from the Professional Coin Grading Service. Certified as a First Strike Series coin. 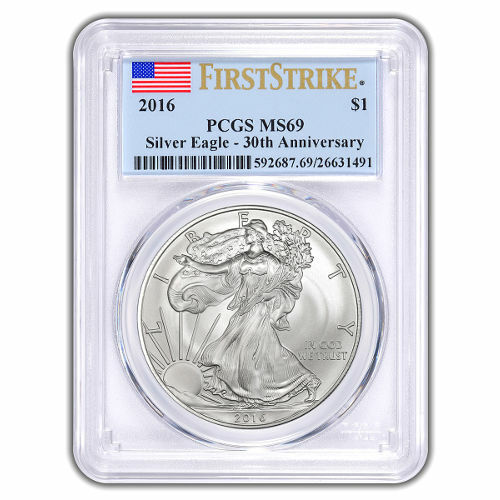 Each of the 2016 Silver American Eagle coins available for purchase today on Silver.com is considered a near-perfect specimen by the PCGS. Coins with a Mint state 69 grade have their full, original luster, but also feature a maximum of two minor detracting flaws on the surface. Coins designated as First Strike Series products must meet strict criteria in order to obtain this label. The PCGS must receive these coins in sealed US Mint boxes at one of its depositories, or an approved third-party facility, within the first 30 days of the release date set by the mint. The Silver American Eagle was introduced in 1986, and in recent years has set tremendous sales records that outpace the total sales predating those years. For example, the US Mint saw record sales of 44 million coins in 2014, a total greater than all production years from 1986 to 2010 combined. That record was short lived though, as the Silver American Eagle broke its sales record again in 2015 with 47 million products sold. On the obverse is the image of Walking Liberty, emblematic of the nation’s constant strive to discover a brighter future. The heraldic eagle of the United States is featured on the reverse of all coins. Please direct any questions you have to a Silver.com associate. You can reach us on the phone at 888-989-7223, online using our hosted web chat, or by sending us an email. Awesome investment. My first purchase from these guys, but it won’t be my last!